How can a business proposal be taken seriously if it does not contain a graphical presentation of your project activities? 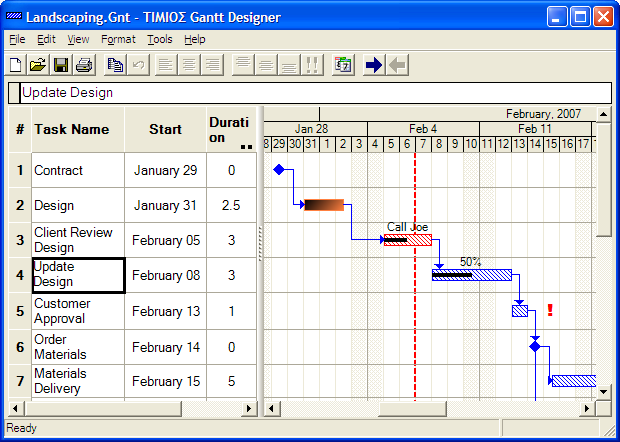 If you need a nice Gantt chart fast to demonstrate that you have done due dilligence, Gantt Designer is the tool for you. Most acknowledge that Microsoft Project is too difficult to use if all you want is a nice-looking Gantt chart. For example, unless you are a project management guru, you would be puzzled why some tasks jump all over the place when you make a little change. There are a number of low-cost alternatives to Microsoft Project. But none of them come close to the features for Gantt chart desigining found in Project. Timios Gantt Designer is an exception. Gantt Designer is serious but easy-to-use and focussed solely on Gantt charting. Textual data are entered like in a spreadsheet. For data that can be graphically represented, eg start time or duration, you can use your mouse to drag and resize time-bars. Charting assistance with true calendaring. Specify the number of days required to complete a task and Gantt Designer will automatically take care of weekends and holidays. Updates automatically as you change the start date. Drag and drop to link tasks, with extensive checks on dependencies and affected tasks will be automatically re-scheduled, visually and instantaneously. Links that are meaningless are prevented. Very flexible printing options that are a breeze to set up. Spans large charts across multiple sheets with ease and like what you would expect. You can also print to a crisp image file for inclusion into web pages. Copy and paste portions or whole chart into other Office documents with ease. Catered to an international audience, Gantt Designer is Unicode-enabled and local settings for date/time and number formats are used. This site does not contain serial number, crack, keygen Gantt Designer serial number : serial number is the simplest type of crack. A serial number(cdkey,product key,etc) is register the program as you may already know. a crack or keygen may contain harmful software. If you cannot find the exact version you want, just give it a try. for more information read .nfo/.txt/.diz file include in zipped file.